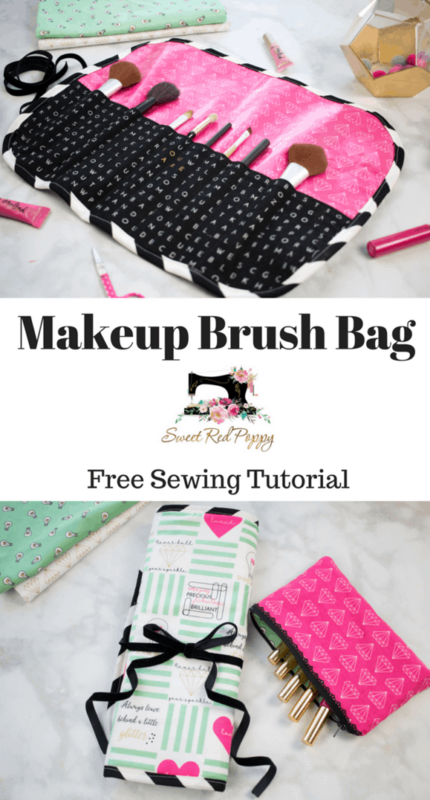 Today Kim from Sweet Red Poppy is here to teach you How to sew a makeup brush roll bag. 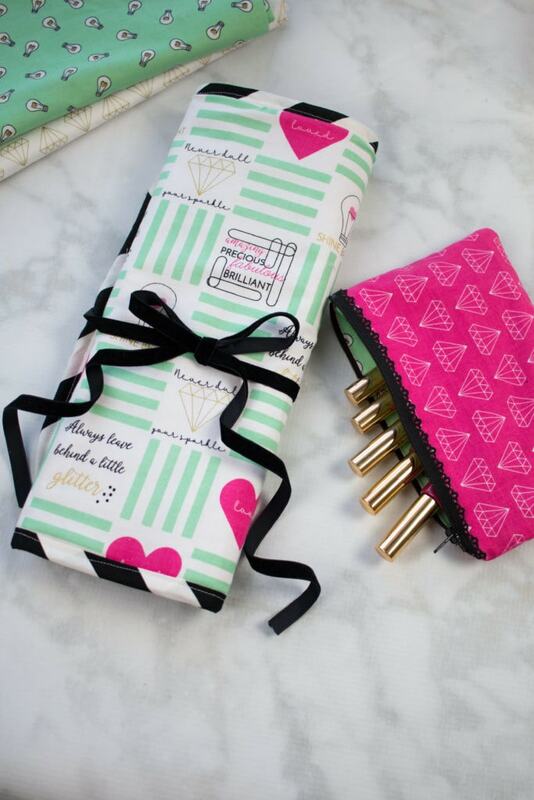 This Makeup Brush Roll Sewing Tutorial would great to use to stitch up a gift for one of your best girlfriends! 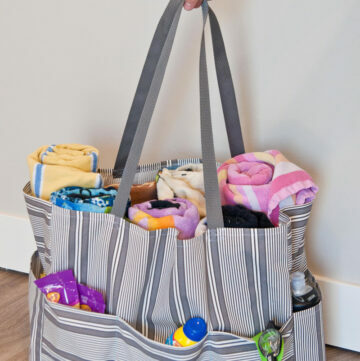 If you like this project, you may also like this Lined Drawstring Bag Tutorial. 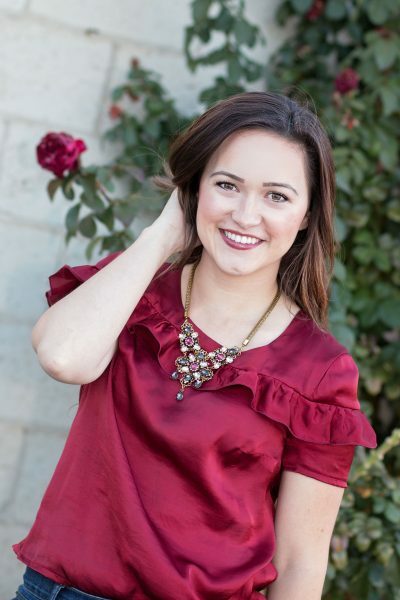 Hi, It’s Kimberly from Sweet Red Poppy! 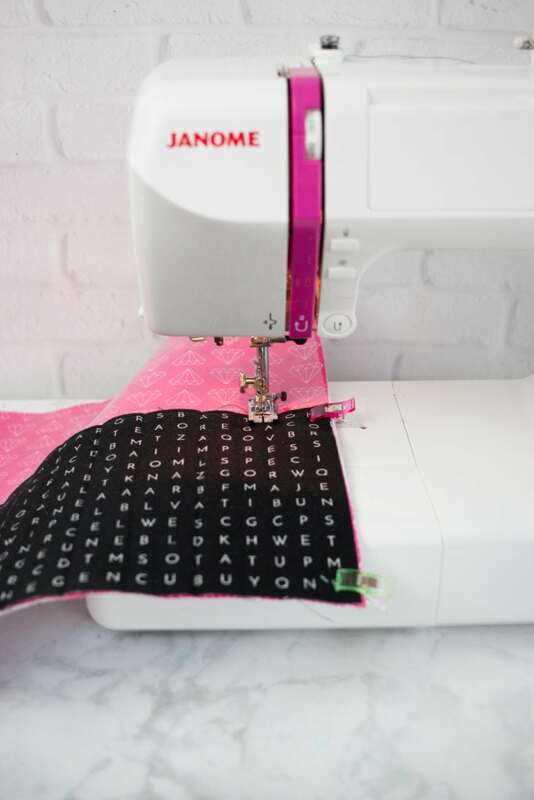 We’re down to Christmas present crunch time and I have the perfect gift idea for you if you still have some last-minute gifts to sew! 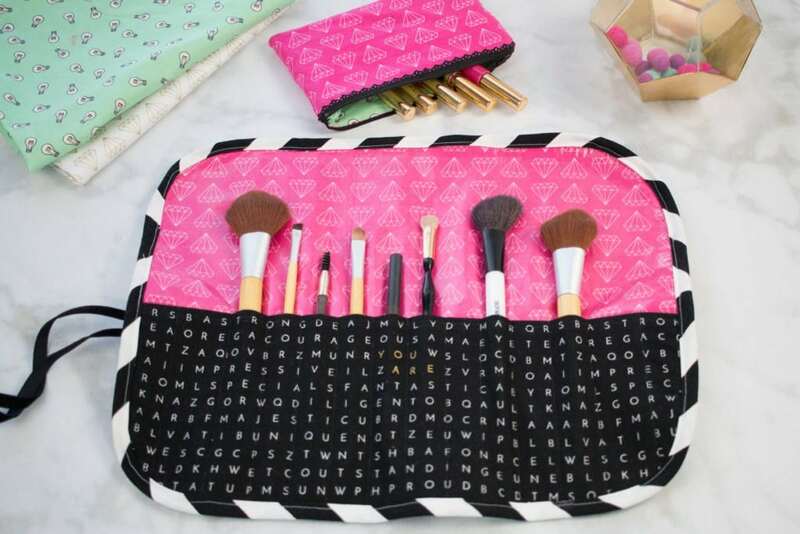 This makeup brush roll-up bag is a wonderful gift! 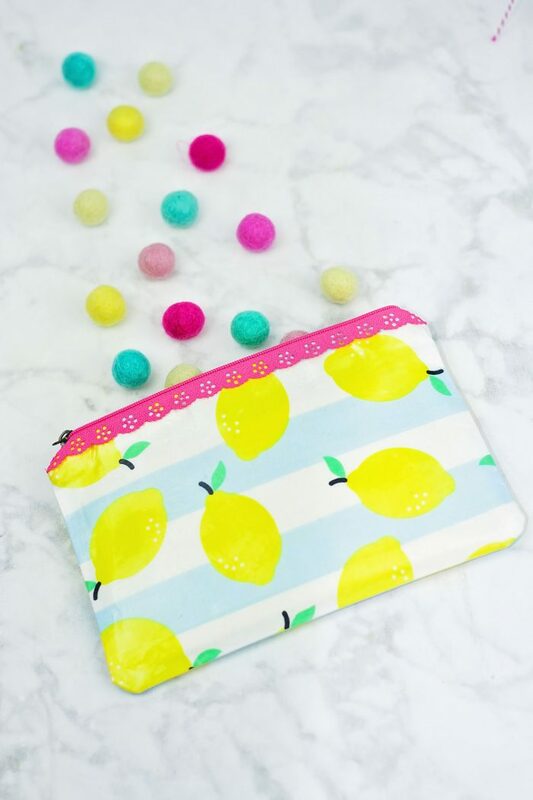 It’s easy to sew and it’s absolutely adorable! 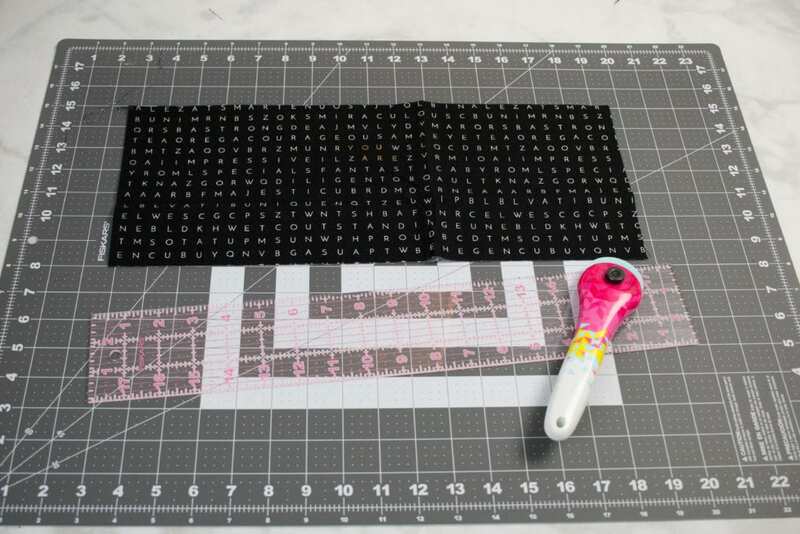 Cut out all of the pieces listed in the cutting chart above. 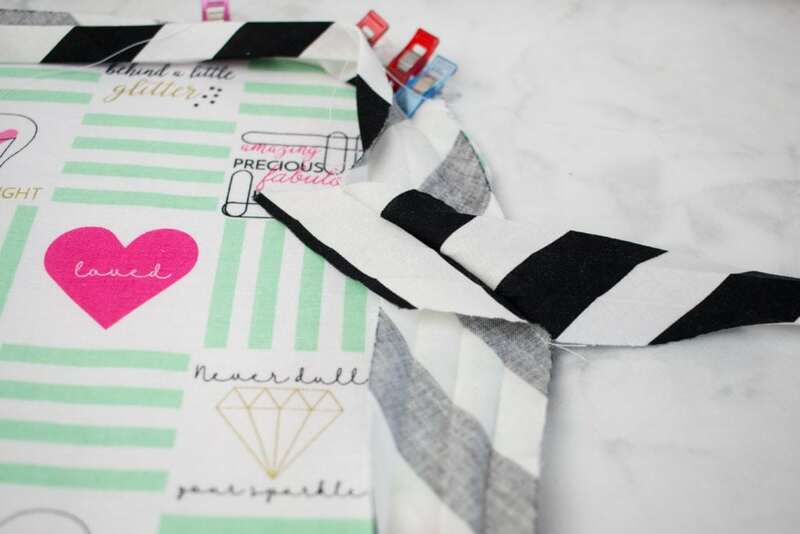 Place the sticky side of the fusible fleece against the wrong side of the lining fabric. 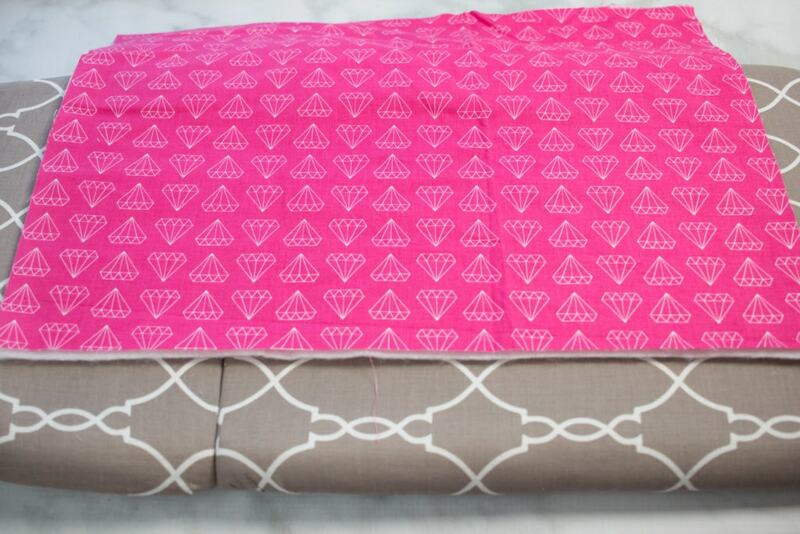 From the right side of the lining fabric, press with a hot iron to fuse the fleece to the fabric. 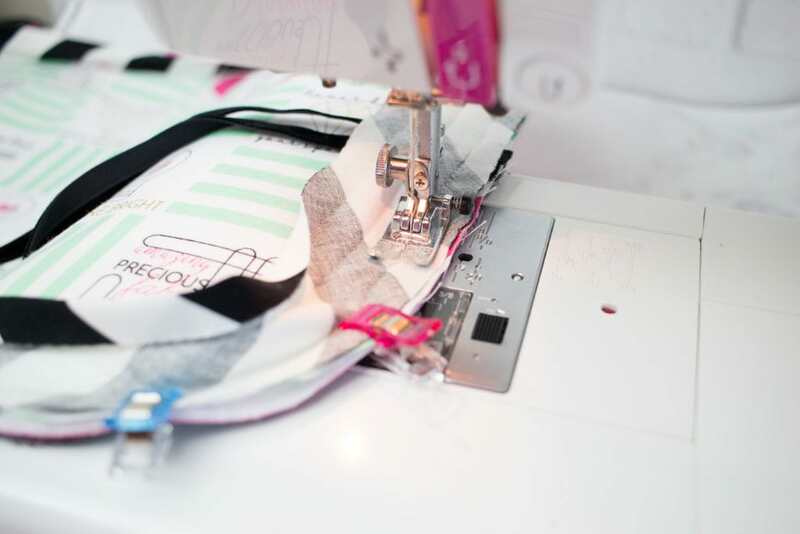 Pull back the paper lining from the clear vinyl and place the sticky side against the right side of the lining fabric. 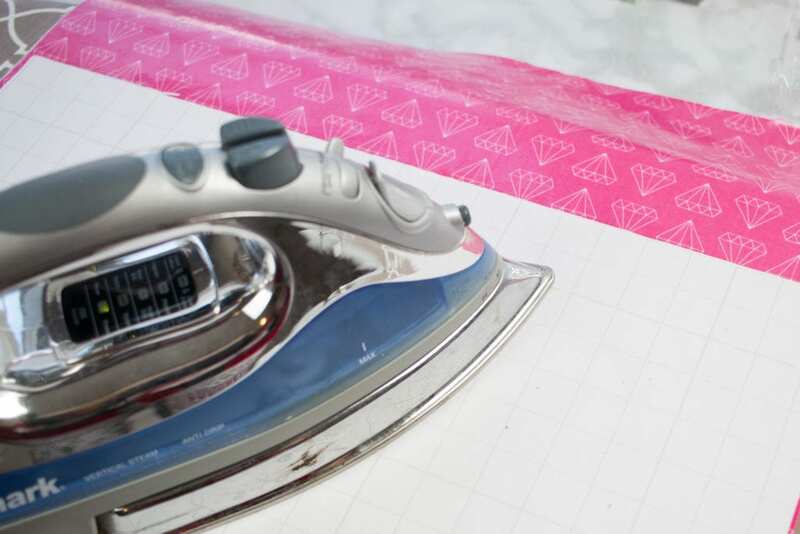 Cover the vinyl with the paper liner and press according to the directions listed on the packaging. 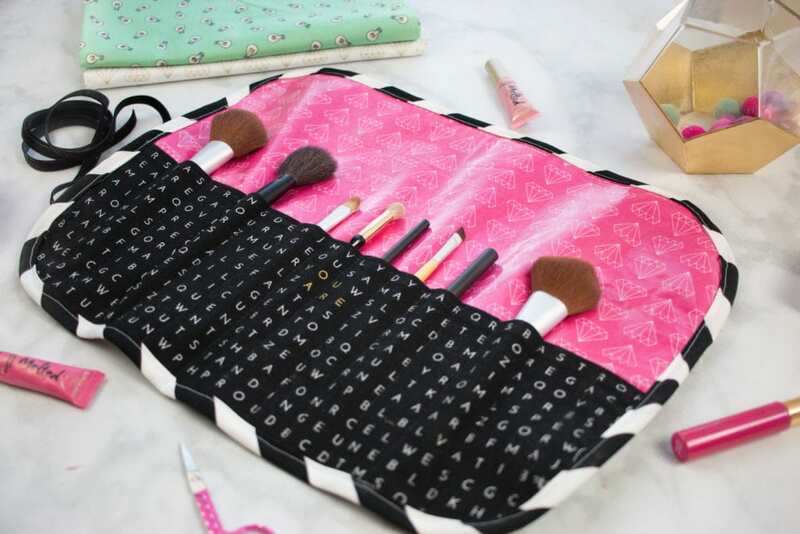 The clear vinyl will create a barrier between the fabric and the brushes making for easy clean up if the brushes have any makeup left on them. Allow the vinyl to cool completely. 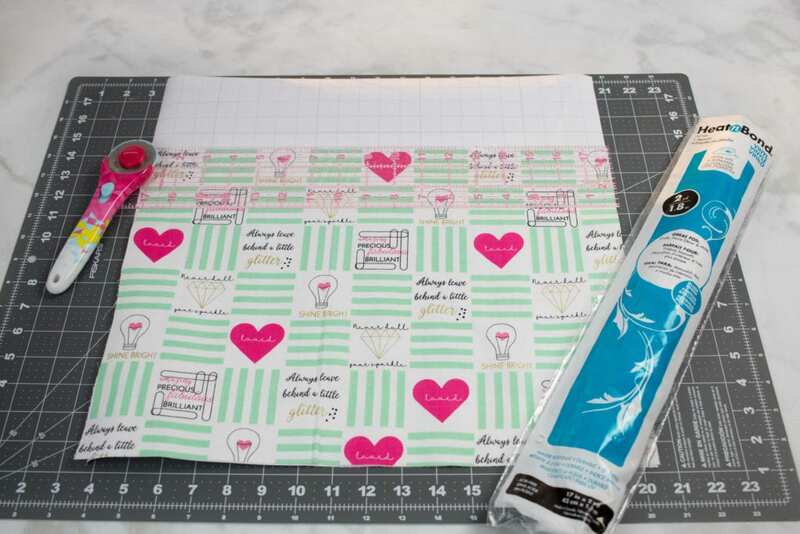 Take the lower lining and fold the top edge back 1/2 inch and press. Fold back 1/2 inch and press again. Sew 3/8ths inch from the folded edge. 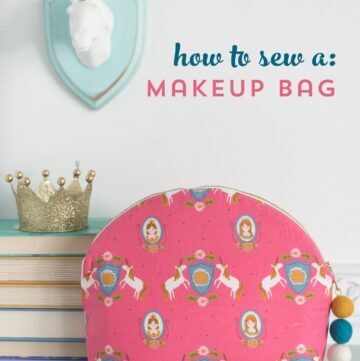 Fold the lower lining in half and in half again. 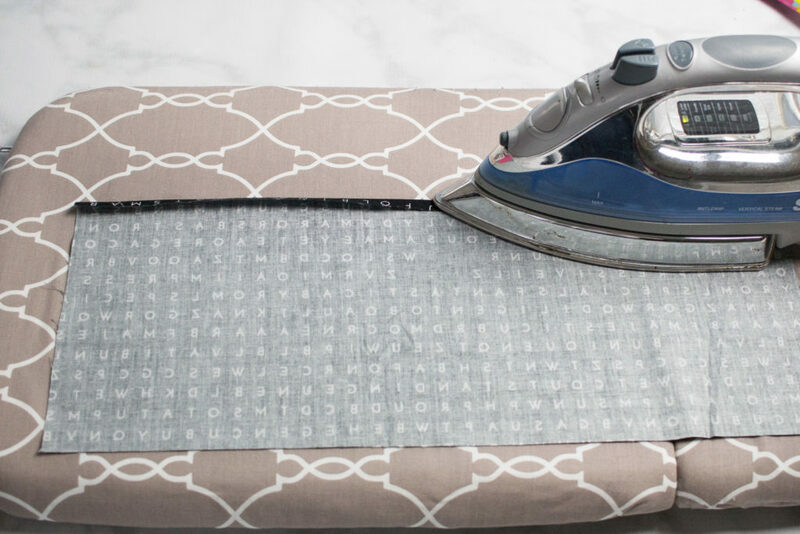 Iron the lining to make vertical creases. 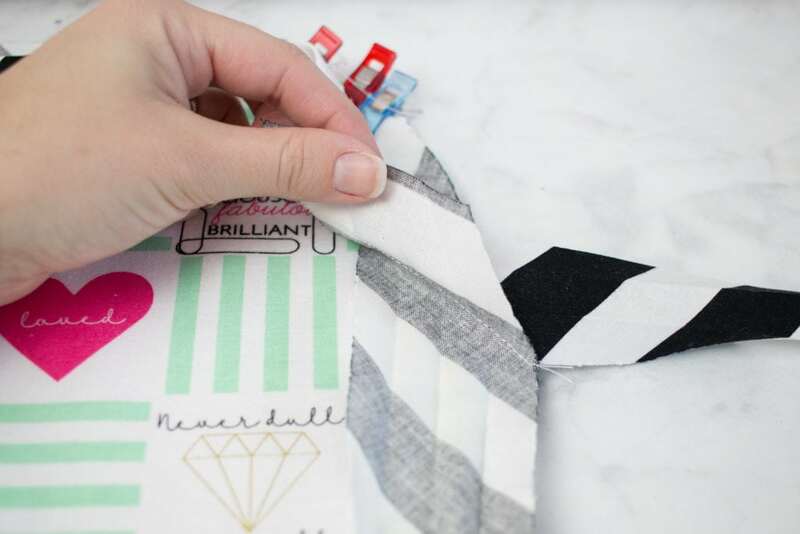 From this point, if you would like smaller pockets you can fold each fourth in half again or leave some of the pockets larger. 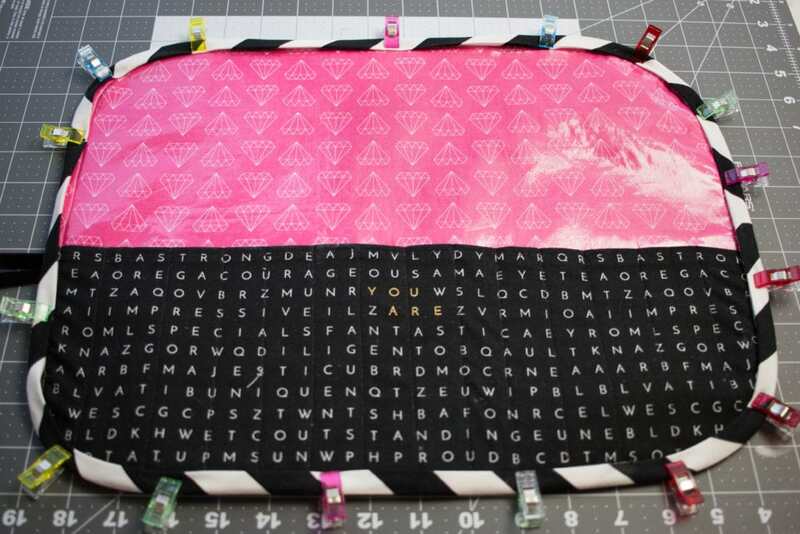 With the lining right side up, lay the lower lining on top aligning the edges and the bottom. 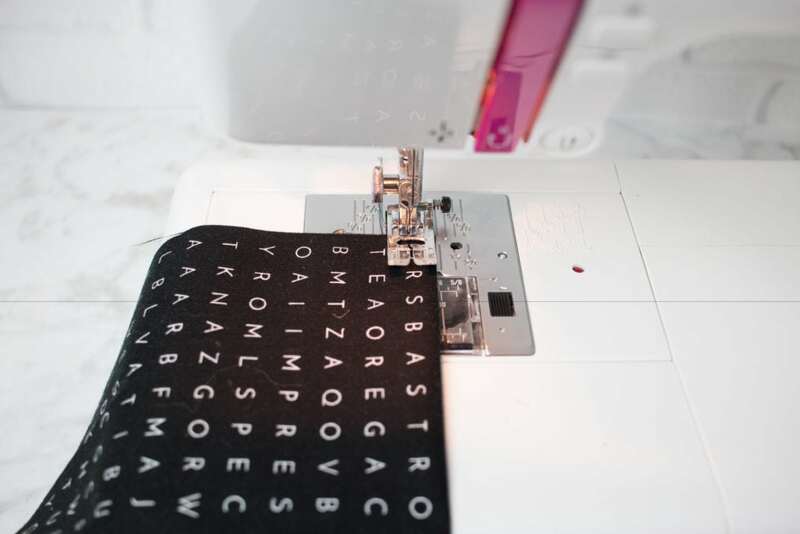 Sew along the markings, making sure to backstitch at the beginning and the end of each seam. 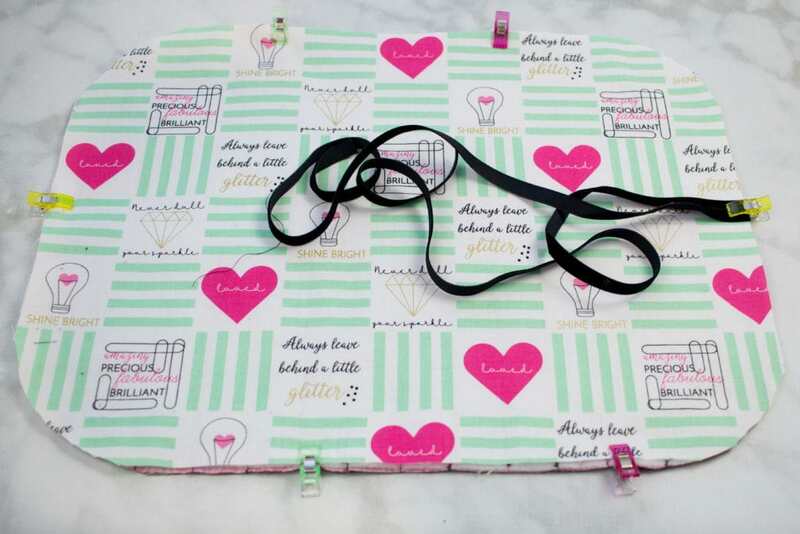 Place the wrong side of the main fabric against the Fusible Fleece. 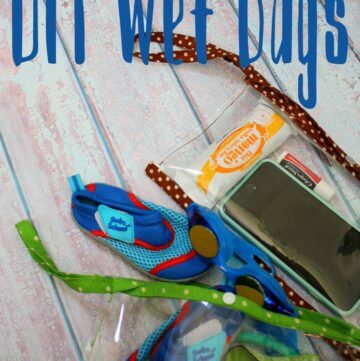 Using Craft Clips, clip the sides together. 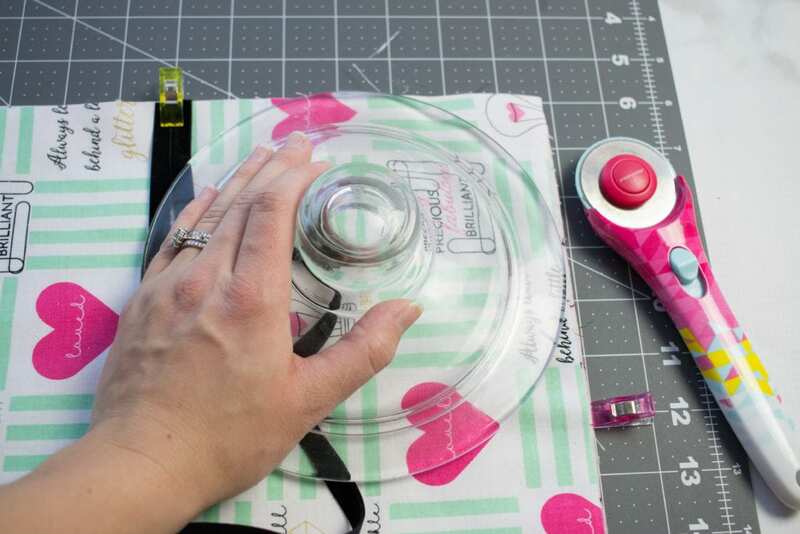 Use a large plate as a template to create a rounded edge on each corner. Place the plate face side down against the corner and trim around each edge. 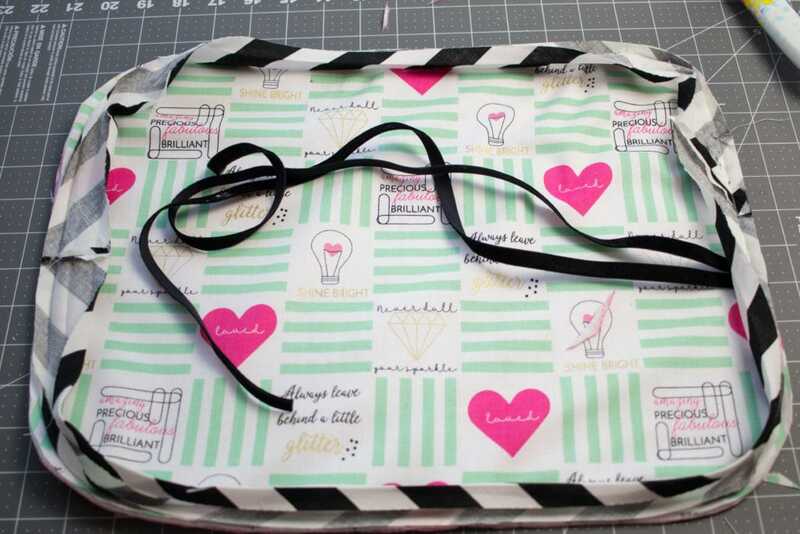 Open up the bias tape so that the wrong side is facing upwards. 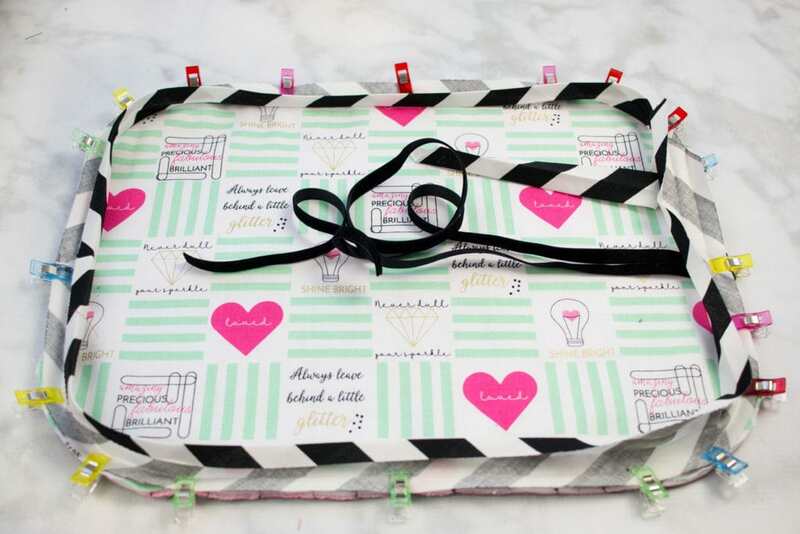 Place the bias tape along the perimeter of the bag with the fabric right sides together. 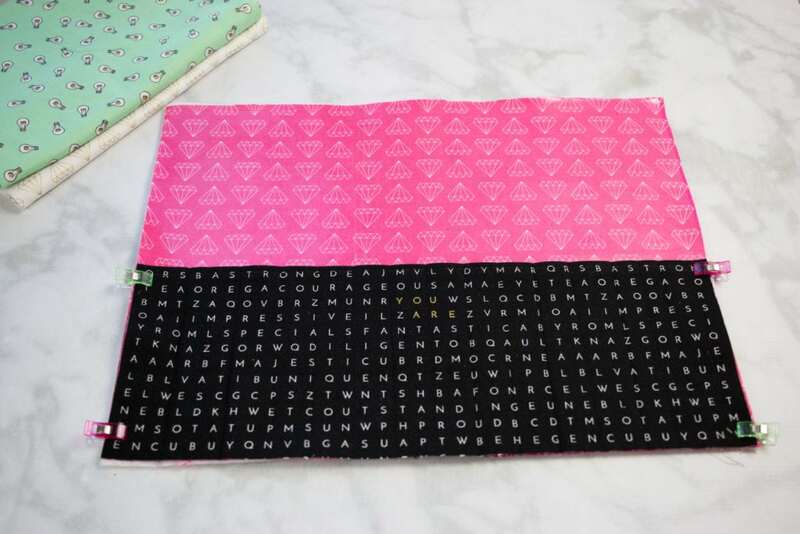 Align the edge of the bias tape with the edge of the main fabric. 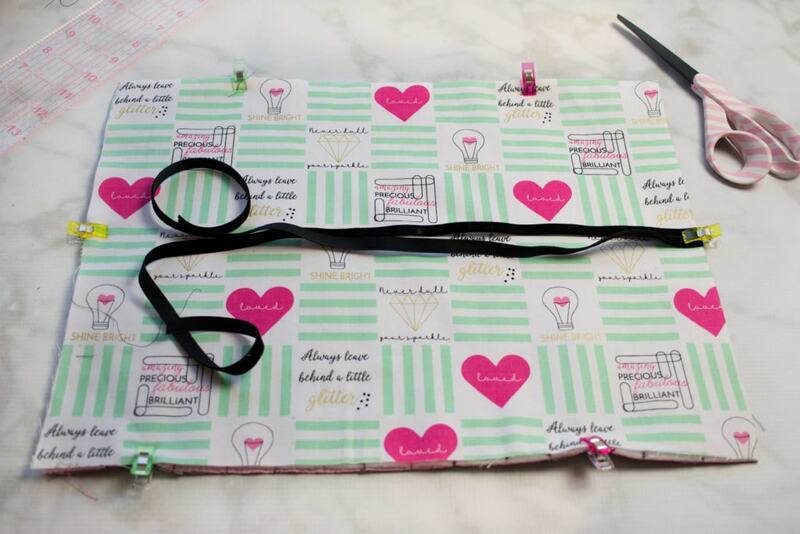 Stretch the bias tape ever so gently around the corners. 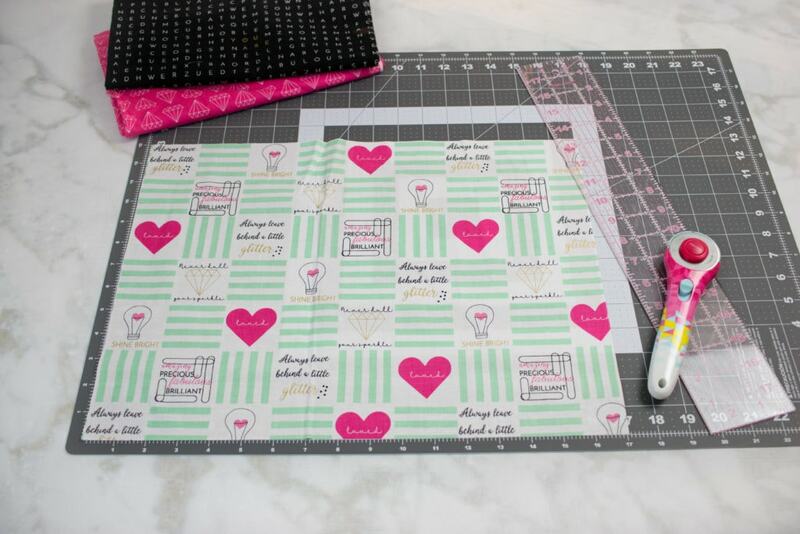 Sew along the first fold closest to the edge all the way around the bias tape. 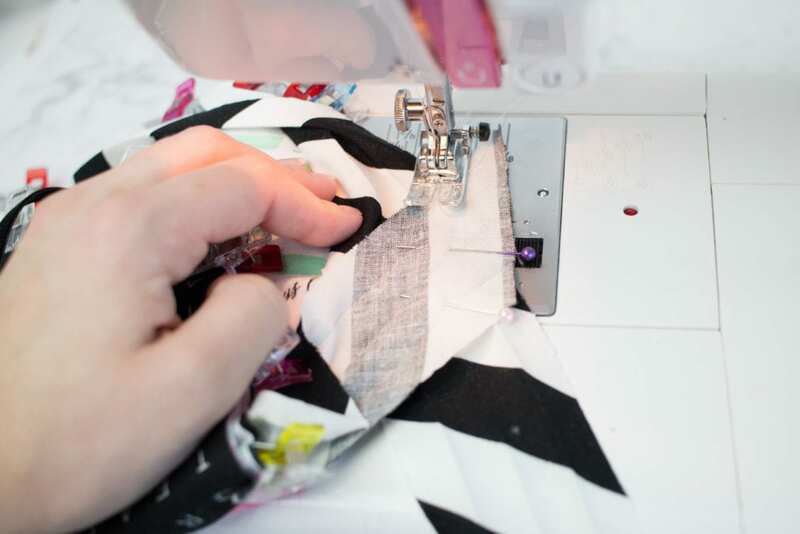 Press the bias tape away from the bag so that it wraps around to the other side. 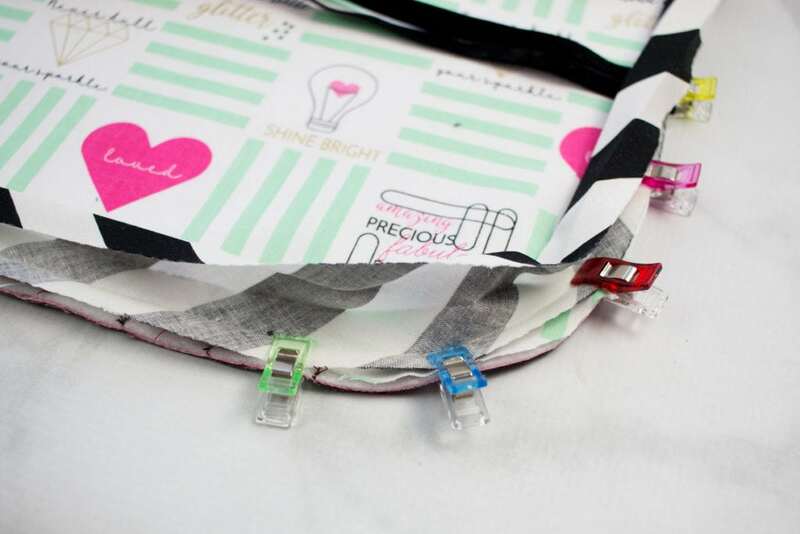 Clip the bias tape around the entire bag making sure that the bias tape is even on both sides. 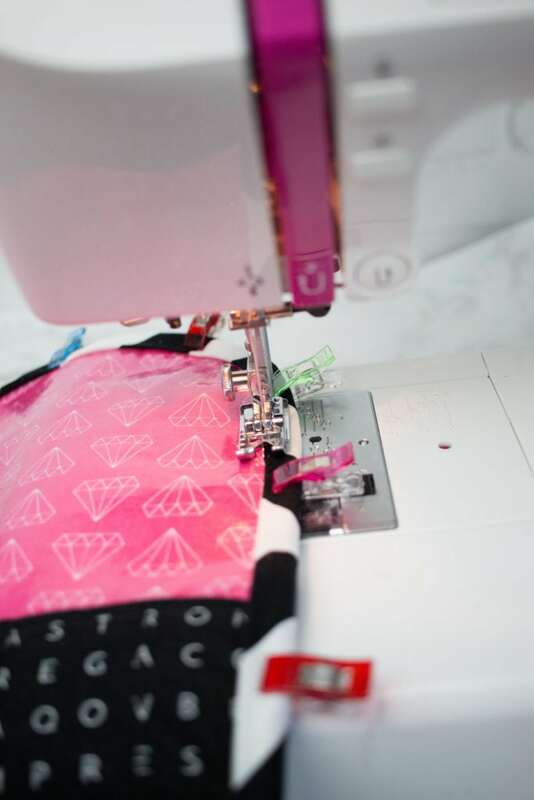 Top stitch around the entire bag. Wasn’t that easy? 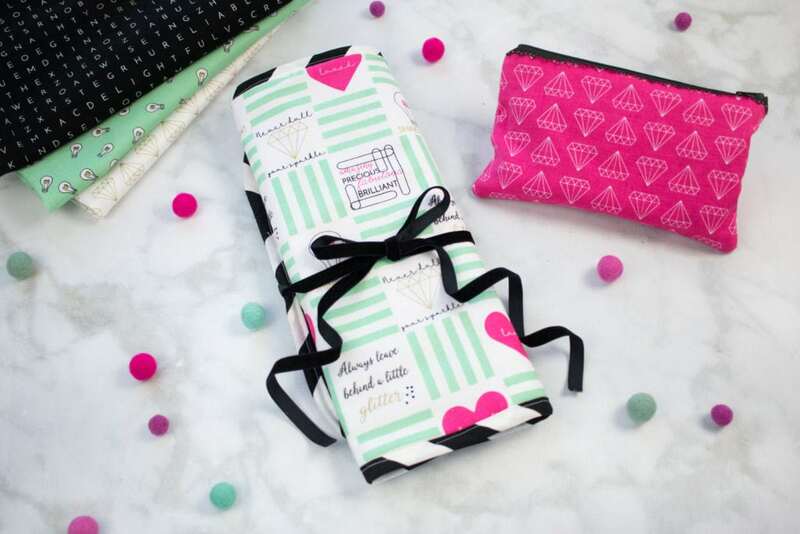 I’ve already made a few of these bags for Christmas presents! 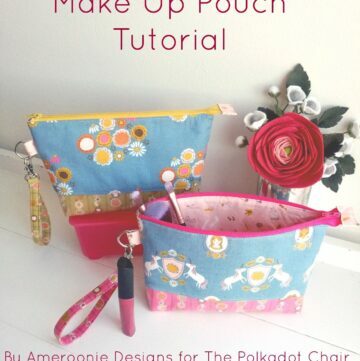 Grab the tutorial for the matching lipstick zipper bag here. 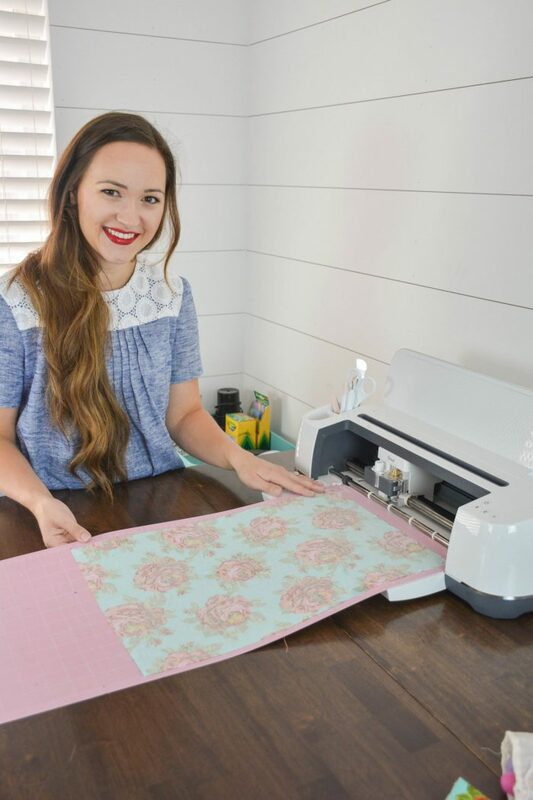 If you enjoyed this tutorial you may also enjoy these tutorials. Was wondering what the stripe material on the brush bag. So cute!